Rasheed Wallace, on the sidelines as an assistant coach for the Detroit Pistons during a game against the Golden State Warriors in Auburn Hills, Mich., on Feb. 24, 2014, was announced Friday morning as the new varsity boys basketball coach at Jordan High in Durham. Wallace, who played 16 seasons in the NBA after two years at North Carolina, is the second member of the Tar Heels' 1995 Final Four squad to coach high school boys basketball in the Triangle area, joining Donald Williams at Wakefield High in Raleigh. 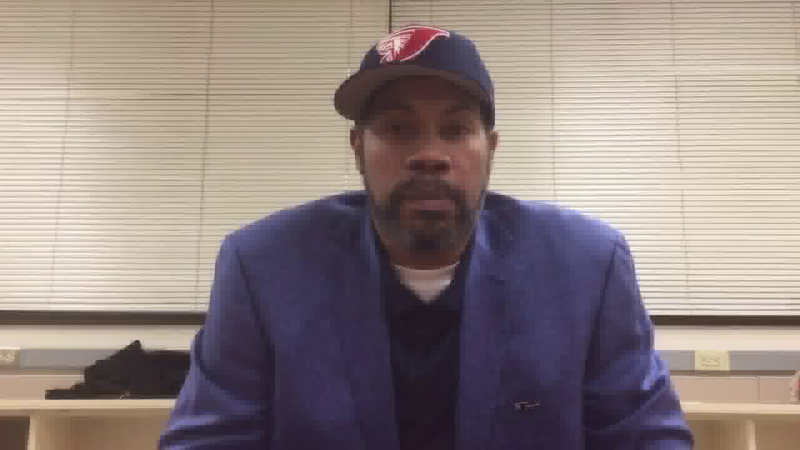 DURHAM — Former University of North Carolina star and longtime NBA player Rasheed Wallace will be named the head coach of boy's varsity basketball team at Jordan High School at a press conference scheduled for Friday at 10 a.m inside the school's media center. The Falcons are coming off of a 7-17 campaign in 2018-19. Jordan finished 1-9 in the Triangle-6 and ended its season Feb. 18 with a loss to Panther Creek in the conference tournament. Wallace arrived at North Carolina in 1993 as the USA Today High School National Player of the Year. As a freshman, he helped the defending national champions win the 1994 ACC Tournament title and was the second-leading scorer as a sophomore the following season when the Tar Heels reached the Final Four in 1995. After foregoing his final two seasons of eligibility at North Carolina and declaring for the 1995 NBA draft, Wallace played 16 seasons professionally with the Washington Bullets, Portland Trail Blazers, Atlanta Hawks, Detroit Pistons, Boston Celtics and New York Knicks. He was named an NBA All-Star four times, appeared in three Finals, and won the 2004 NBA title with Detroit. Wallace, 44, retired after the 2013 season. He spent the following season as an assistant coach for the Pistons. Known as a fiery competitor while in the NBA, Wallace also had a soft spot for helping those in need. The 6-foot-11 forward won both the Wilt Chamberlain Community Service Award (2005) along with the NBA Assist Award (2006) for his charitable contributions. "This is a special day for Jordan High School and our athletic department," Jordan High School's Director of Athletics Shelba Levins said. "When we seek leaders for our athletic programs, there are several different types of criteria that are important. We want coaches who can provide both knowledge and leadership with an ability to mentor our student-athletes as they cross the bridge from adolescence to the early stages of adulthood." With his hire at Jordan, Wallace is the second member of North Carolina's 1995 Final Four team to join the high school coaching ranks in the state and is also one of two former Tar Heels to coach in Durham. Donald Williams is currently the head coach at Wakefield (Wake Forest) High School while David Noel, a member of UNC's 2005 national championship squad, is the head coach at Southern Durham. "It is not every day that you can add someone with as rich of a background in basketball, mentorship and volunteerism as Rasheed Wallace," Levins said. "I am thrilled to welcome him to Jordan and the Falcon family."